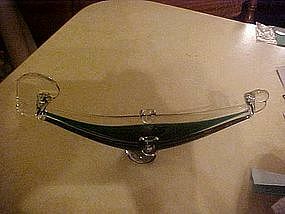 Made by Indiana glass for Tiara in the 1960's. This mini bread tray measures 5 1/2" by 3 3/8" and is a very light blue color. Perfect condition. Relief mold of the Lords Supper. I have two of this color and a light pink one. All are in perfect condition. Also have the large one listed. THis little hand painted figurine is just adorable,. 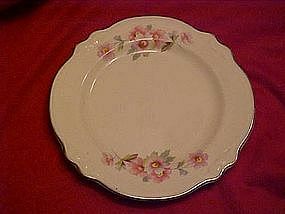 Made of porcelain bisque and hand painted. She has a little pink bow in her hair. 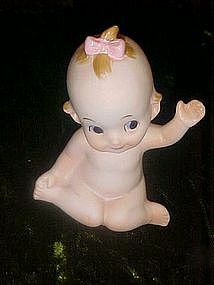 She resembles a kewpie but has no wings. She has the original foil Kelvins sticker on the bottom. Pristine condition, and measures 3" tall. 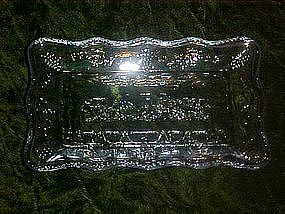 Amazing vintage ashtray measures 13 1/4" long. Beautiful murano glass made into gondoliers’ Designed in the factory in Venice and the glass being hand turned. Hand blown teal cased in clear. Sits on a clear foot. This is in perfect condition. Email if you would like to see a closeup section of it. White glass pyrex shakers have the blue snowflake garland pattern. Chrome look plastic tops. Measures 3 1/2" tall. No chips or cracks and chrome plating is good. I believe these are made by Stanley products. I have seen them in red before. Made of a light celluloid plastic. They have a pat'd ball shaker in the tops. Shaped like a bullet and measures 3" tall. Nice condition. 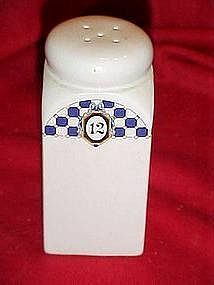 This ceramic spice jar measures 4" tall and is in perfect condition with stopper. It has a blue tiles design on the upper shoulder area and the number 11 in a medallion. 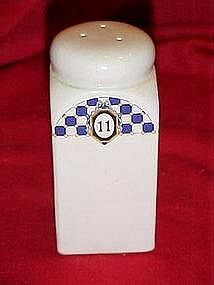 White ceramic spice jar with blue tile design on the upper shoulder area, with a number 12 in a medallion. Measures 4" tall and has a rubber stopper. Perfect condition. 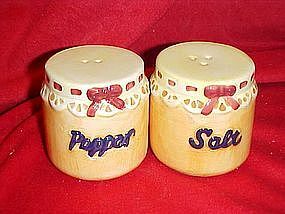 These are plain and simple salt and pepper shakers that were made in Hong Kong 1974. They measure 4" tall and are in great condition. 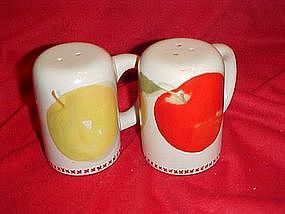 Nice set of stoneware shakers with handles. 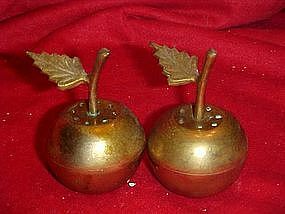 Measures 3 1/2" tall and has a golden yellow apple on one side, and red apples on the other side. I have them shown in photo so you can see one of each. No chips or cracks, but thestoppers are a bit worn and could use new ones. 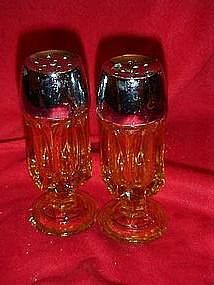 Tall paneled glass salt and pepper shakers on a footed pedestal. Measures 4 1/2" tall. Pretty amber colored glass. Plastic tops with chrome plating. There is two very small spots that have peeled on the chrome tops. (rim area). No chips or cracks. 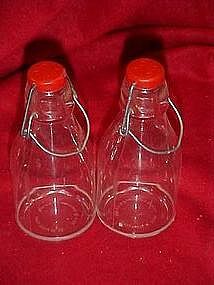 These are older plastic shakers in the shape of a light house with a ship wheel a top. The ship wheels have a compass inside. Paper label with Marine land of the Pacific.Silver is off the back where there used to be a label. Made by Enco Inc. One bottom stopper missing. Measures 3 1/4". 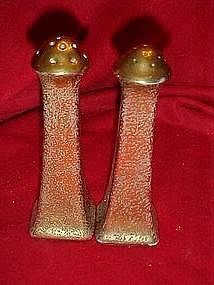 Old salt and pepper shakers are made of porcelain and are completely encrusted in gold with mushroom cap tops. They measure 5" tall and have their original cork stoppers. Red Japan stamp. Perfect condition. 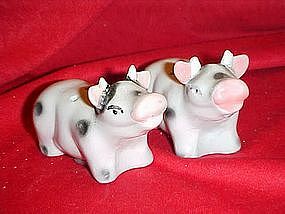 Porcelain salt and pepper shakers that are little black and white cows with pink detailing. Measures 2 1/4" tall and are 3 1/4" long. Plastic stoppers and are in perfect condition. 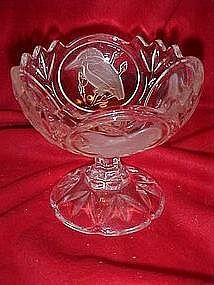 Lovely footed crystal compote measures 4" tall and has four panels of frosted wild birds. All birds are a different variety. Perfect condition. Made of a good grade lead crystal. Dish has a great ring when tapped. Pristine condition. 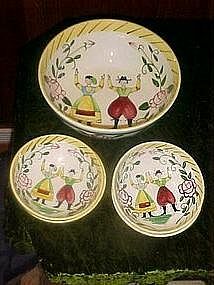 Made of hand painted glazed ceramic. 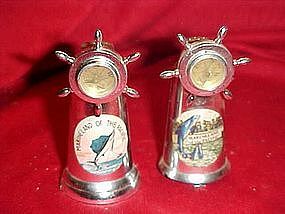 These salt and pepper shakers measure 2 1/2" tall and are made by CCA international. Plastic stoppers. There is a very tiny glaze chip on the rim of one.